now reading: Is Alcohol a Performance-Enhancing Drug? Is Alcohol a Performance-Enhancing Drug? August 30th, 1904, 2:30 p.m., St. Louis, Missouri: The time and place for the marathon race of the Third Olympiad. The day was sweltering, with temperatures rising past ninety degrees. The 34 runners weren't breathing the air that day; they were drinking it. As they took their places at the start line, they stretched and heaved with nervous anticipation, knowing that they would be forced to plod along dirt roads studded with rocks, and to surmount seven towering hills. The racers' brows dripped with perspiration before the race was even underway. Their sweat-drenched clothes clung to their bodies. At the crack of a gunshot, the contest commenced. It quickly degenerated into a debacle. For some inane reason, someone thought it was a good idea to have horses precede the racers. Before long, competitors were choking on clouds of dirt and dust that were kicked up by their hooves. Wild dogs were also on the loose that day, and chased many of the runners off the course. When all was said and done, over half of the field succumbed to the fumes, heat, and utterly ridiculous conditions. 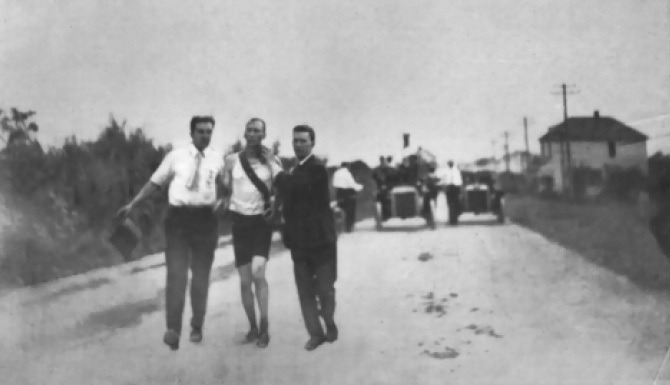 The man who survived the fastest was Thomas Hicks, at a time of 3:28:53. It remains the slowest winning time in an Olympic marathon ever. Despite the slogging pace, Hicks almost didn't make it. Demoralized and lagging in the final stages, he begged his managers to let him concede, but they did not. Instead, they gave him three egg whites, strychnine, and a large helping of brandy. This questionable sustenance allowed Hicks to finish the race, but almost killed him in the process. No wonder, because strychnine -- then known as a stimulant, but today used as a pesticide -- can, even in very small doses, cause vomiting, muscular convulsions, and rapid death by asphyxiation. Thomas Hicks receiving support from his managers on his way to a gold medal victory. What was it that drove Hicks from the jaws of defeat into the arms of victory? Egg whites, though rich in protein, aren't known to give sudden athletic boosts and, given its side effects, strychnine hinders athletic performance more than it helps -- but what about alcohol? After all, Greek competitors in the original Olympic Games would commonly imbibe wine potions to augment their performance. Centuries later, Roman chariot riders fed their horses honeyed alcohol to make them run faster. Despite its use in the ancient world, and though alcohol is the most commonly consumed drug amongst athletes, today, no serious competitor would think to throw back a few drinks before a competition. Even in small quantities, alcohol can impair reaction time, motor control, balance, information processing, and judgment -- all essential sporting skills. So then why has everyone, at one time or another, heard the phrase "I play better when I'm drunk?" Granted, the imbiber uttering this platitude often isn't referring to basketball, football, or anything very physiologically demanding, but they are usually talking about a game that's at least partially skill based, such as bowling, billiards, darts, or even baseball. There's no hard evidence to back the common assertion of alcohol-improved performance, but anecdotes abound. You probably can point to a few yourself. Most notably, in 1998 pitcher David Wells threw a perfect game for the New York Yankees while self-reportedly "half-drunk, with bloodshot eyes, monster breath and a raging, skull-rattling hangover." Is it possible that alcohol could, in some small way, enhance performance? Well, we know that performance in any skill-based game is at least partly affected by one's psychological state. For example, it is widely accepted that the reason why athletes under-perform under pressure is because they "think too much." It's thought that this disquieting state causes minor deviations in repetitive athletic tasks, such as shooting or swinging motions, adversely affecting sports performance. Athletes execute repetitive tasks better when they do so automatically, without thinking, relying simply on muscle memory. Now, I wonder, what's a great way to return someone to a calmed, unthinking state? I think you can guess the answer: A nice cold one. "It is our contention that certain individuals--specifically, competitors who are average/good but not exceptional in a particular sport--perform best in competitive arenas that allow the easy consumption of alcohol (darts, bowling, pool, etc.) when they reach what we term their Optimal Altered State, or OAS. Now, clearly this is not the moment we see someone doubled over talking to the toilet bowl for comfort, or standing atop a building yelling that they know the secrets of the Woodstock festival. We are talking about that point--this may be one drink for some people; four or five for others--where you have consumed just enough alcohol to make you feel supremely gifted." These experts stress that their theory is not an endorsement of drinking, merely an acknowledgement that "the positive psychological effects of imbibing moderate amounts of alcohol might outweigh the negative physical effects" in certain instances. This may very well be true. After all, it was three egg whites, strychnine, and a nip of liquid confidence that propelled Thomas Hicks to an Olympic gold medal on a swelteringly hot August day in St. Louis more than a century ago.